KAWS was born Brian Donnelly in Jersey City, New Jersey. He began his career as a graffiti artist growing up in Jersey City, New Jersey. Later moving to New York City in the 1990s, KAWS started subverting imagery on billboards, bus shelters and phone booth advertisements. 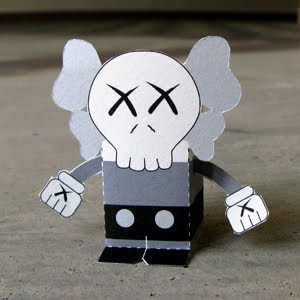 In the late 90s, KAWS began to design and produce limited edition vinyl toys. More toys and later clothing were made for Original Fake, a recent collaborative store with Medicom Toy. One of KAWS' early series, Package Paintings, was made in 2000. This series, entitled The Kimpsons, subverted the famous American cartoon, The Simpsons. Download the PDF file here and make your own KAWS toy! Still digging the series of artists you've put together.